Helen Mirren in a scene from "The Leisure Seeker." When last we saw Tony-winning, Emmy-winning, Oscar-winning Dame Helen Mirren, 72, she was drinking tequila on the red carpet and riding a Jet Ski at the Academy Awards. That leads to an obvious question: Would she have jumped on the ski if she hadn't been drinking tequila? "I only had one little shot," said Mirren. "I did it because I promised to do it. I'd said I would." And how long did it take to plan the stunt? "Seconds," she said. "Literally a last minute. They asked me to do it and I said, 'Sure.' It was stand here, go there, and then it was over." More planning went in to her next appearance on the show, sharing the stage with Jane Fonda to present the award for best actor. Mirren talked about their shared 50 years in front of the camera and the changes they've seen along the way, leading to today's #MeToo and Time's Up movements. "I think for an awful lot of women, this is something we've been waiting for for a long time, the Time's Up movement. I say it's about time. Why didn't this happen 30 years ago? That doesn't mean I'm not joyful that it's happening now. I am. But I'm aware that the work of effecting change is still in front of us. We'll have to wait and see how it plays out," Mirren said. The signs are encouraging. Mirren, although she is officially a dame commander of the Order of the British Empire, is of working-class origins and is most interested in the way nonfamous women — working stiffs — have made strides on film sets. "You have to understand, when I started making movies, I was often the only woman on the set. On a big movie, you can see 150 people running around. That's a lot of jobs. And lately I've been seeing more and more women in the technical jobs, and it's great. These are jobs that pay well and, until recently, they've been reserved for men. I had a female boom operator on one recent job. That requires amazing upper body strength, and this woman was solid," Mirren said. She made Collateral Beauty with Will Smith and was pleased to see (still a rarity) a female cinematographer, Maryse Alberti. "All of her camera crew were women. When you see things like that happen, it means a great deal. Because it puts an end to outdated ideas. You can no longer say women can't do it, because they are doing it," said Mirren. As an actress, Mirren has been doing it, and doing it well, since the late 1960s, alternating among stage, film, and television — winning a Tony for The Audience, Emmys for Prime Suspect and other roles, and an Oscar for The Queen. 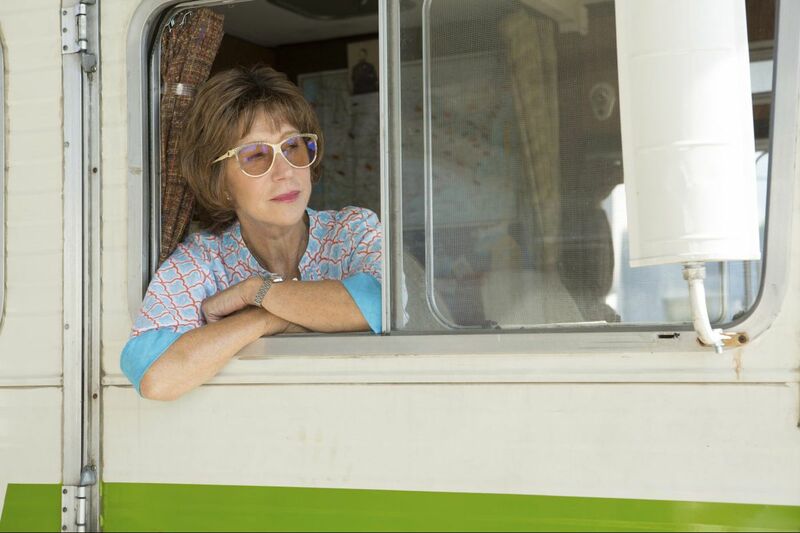 Her latest is the independent drama The Leisure Seeker, the story of Ella and John Spencer (Mirren and Donald Sutherland) taking a final road trip — Sutherland's character is succumbing to dementia, and Ella wants them to have one final adventure, even if her husband is only flickeringly aware of what is happening. Ella is a Southern woman whose trip takes her past Charleston, S.C., on her way to the Florida Keys. It's linguistic and geographical territory Mirren knows well — she and her husband, director Taylor Hackford, had a home in New Orleans for many years and still return to the city regularly. They once rented a van and drove from Natchez, Miss., to Charleston, looking for antique furniture. She loved the experience, and it's one of the reasons she fell for The Leisure Seeker script. "It was a great little road, just the two of us and the dog, staying in little towns, in bed-and-breakfasts. We filled up the van with furniture and filled ourselves up on great Southern cooking. Fried chicken, black-eyed peas, and collard greens," which Dame Helen split into two posh syllables — coll and ard. A great actress can make even vegetables sound dignified. "Road trips are such an American thing. Ingrained in the American character is being able to comprehend these vast spaces that the country occupies. It's what most impressed me when I first came to this country," said Mirren, who took a passenger train from the East Coast to the West Coast on her way to her first Hollywood auditions some 30 years ago. "The vastness of those spaces, it completely amazed me, and still does." She got over her European bias against cheap "petrol" once she saw how important automotive transportation is for many Americans. She also began to understand why we love our cars so much — it's part of why she was keen to take a role in a recent Fast and Furious sequel, the Fate of the Furious, playing Jason Statham's East End mum. That was great fun, said Mirren, who said she enjoys herself on film sets more than she used to. "Film sets used to intimidate me. Not least because there were so few women on set. The feeling was, you have few friends there. They can be quite intimidating, but that's changed for me. I love it. I do," she said. "I've always had a passion for it, and you have to, because when you're starting out, you don't get paid very much. You have to have a huge passion for it, a curiosity about it and excitement about it. You have to want to be there at 4 a.m., when it's below zero, and I still do."